This book has been sitting on the window seat next to our kitchen table for a week now - and if it's kept my kids' interest so much that they want to use it almost every time we sit down for a meal, then I thought it was worth sharing. I picked this up at a used book store for $1.00 -- and come to find out it is out of print and a fairly sought after book! Who knew? The illustrations are just beautiful and drew me into the book. We sat down with it one day and I just thought I would read for fun to my kids. 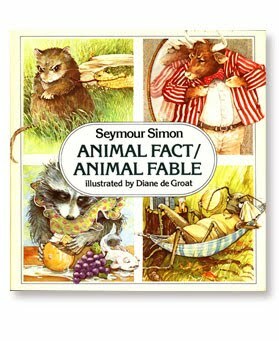 The first thing we talked about was what is a FACT and what is a FABLE -- then I launched right into the book. I can't tell you how many times my children have wanted to quiz me, their dad, their babysitter - they even quizzed grandma on the phone about various facts and fables! I would like to show my kids the illustrator's website because she gives a lot of information about herself when she was a child. It turns out her grandmother was also an accomplished artist as well. You can tell the temperature by a cricket's chirps. Snakes always "charm" their prey. A porcupine shoots its quills. You would be surprised how many of these adults miss! I'm not going to tell you the answers. You'll just have to get this book at your local library to find out the answers! It's worth looking for, because your children will enjoy it!